When most parents think about student absences from school, they think of high school students who skip school or cut classes -- something we generally think of as truancy. But absence from school is also an issue for students as young as kindergarten and first grade and the organization Attendance Works notes that, "one in 10 kindergarten and 1st grade students misses a month of school every year. In some districts, as many as one in four students in the primary grades are missing too much school time." Students in primary grades are rarely absent without parental knowledge. Many parents don't really think too much of having a young student miss school for a family event, or even just parental convenience. For many families the impact of occasional absences may not be significant, but for students who are at risk of failure -- whether because of poverty, English language barriers, or unstable family situations -- absences even in early grades can have a cumulative impact upon academic performance. A seminal paper on this topic, Present, Engaged, and Accounted For: The Critical Importance of Addressing Chronic Absence in the Early Grades, from the National Center for Children in Poverty, found that for students in ninth grade, missing 20 percent of the school year is a better predictor of dropping out than test scores. Furthermore, students with chronic or frequent illness may have excused absences, but unless efforts are made to continue their schoolwork or to make up missed work, something that is often difficult or impossible in less affluent school districts, the fact that these absences may be unavoidable does not diminish their impact upon future performance and graduation. 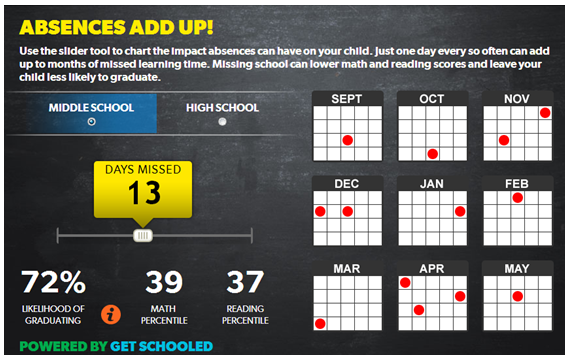 In an effort to raise awareness of the impact of absences, The Advertising Council and the U.S. Army created a website, boostattendance.org which includes tools to help parents understand the impact that absences can have on student achievement. There is also a link to a student-focused tool which enables students to sign up for celebrity wake-up calls. As Woody Allen is credited with saying: "80 percent of life is just showing up." Showing up for school, even in early years, can have an important and positive impact on a student's educational success.